Images Scientific Instruments newest addition to our robotics offerings is the OWI-535 Robotic Arm Edge. Control the arm with the standard manual remote control provided. Or control the robotic arm using Images Serial PC Windows Controller. Software allows user to program scripts using Images PC USB Interface for Windows (see screen shot from program below). Some of the added features of this robotic arm include a search light design on the gripper and a safety gear audible indicator is included on all five gear boxes to prevent injury or gear breakage during operation. The RAI-Pro USB robotic arm interface kit connects the OWI's 535 Robotic Arm Edge (tm) to a Windows personal computer USB port. The interface software allows real time interactive control, plus contains a built-in interactive script writer. A user may write a script that contains up to 99 individual robotic arm functions (including pauses) into a single script file. Script files may be saved and loaded from disk just like any other standard computer file. Simple Plug In - No modification to Robotic Arm Required! The SCRA-01 incorporates three kits; the OWI Robotic Arm, SR-06 Speech Recognition Circuit and the SRI-01 OWI speech interface circuit. By connecting these kits together you create a powerful speech control system capable of controlling the OWI-Robotic Arm Trainer using voice commands. The SR-06 speech recognition circuit allows you to train any word(s) in any laguage to control the robotic arm. You can purchase the kits seperately and build your system slowly or purchase them bundled together. Kits may be purchased as kets needing assembly or assembled and tested. see prices below. 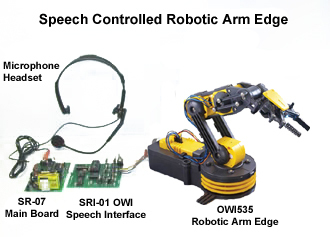 The Speech Controller Kit connects the SR-07 Speech Recognition Kit to the OWI Robotic Arm to allow control of the robotic arm using voice commands. Each robotic function is controlled by a spoken word. The user teaches the speech recognition circuit to recognize their voice and commands. Users can select their own words to control robotic arm function. * Requires both the SR-07 Speech Recognition Circuit and OWI 535 Robotic Arm Trainer (above).